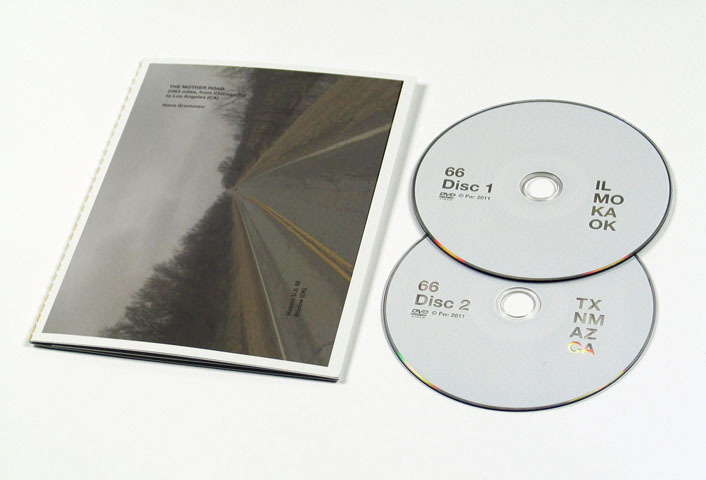 The Mother Road is a publication that contains a double dvd with a five hour compilation video made from screen captures from the famed Route 66 as seen through Google Streetview. Hans Gremmen took 151.000 screen captures following the iconic Street View arrows up the Route 66. Starting from Chicago, traveling down through the American landscape to Los Angeles like a true road movie. You jolt as if in a car when the transitions between images are a bit rough, and you can see the car swerving dangerously to the wrong side of the road, but there is nothing you can do but sit back and ponder about who’s driving you. The Mother Road is the longest stop-motion movie ever made with footage from Google Streetview, and provides a surprising and unique inisight on the American landscape.